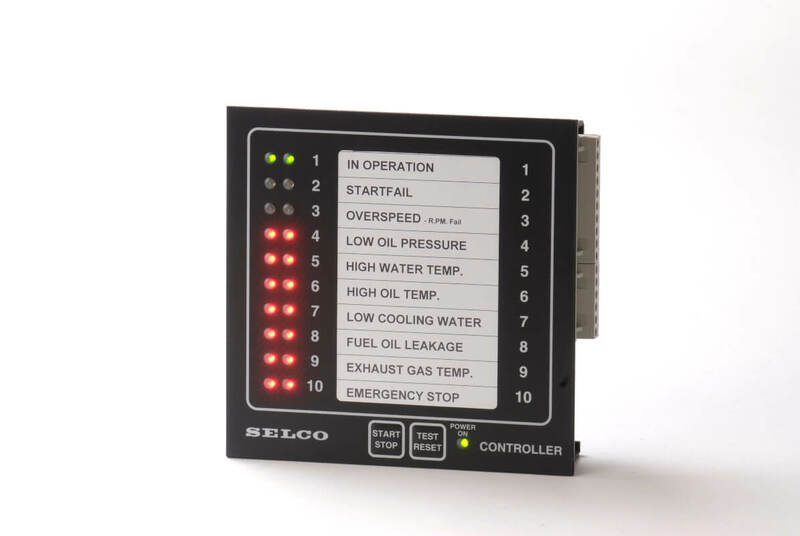 The Engine Controller M2000 offers integrated control and protection of diesel and gas engines. The unit has a compact design for switch panel mounting. The SELCO M2000 Engine Controller will control and protect any industrial combustion engine, which accepts discreet I/O signals for control of the crank, the fuel valve and the stop solonoid (if applicable). The engine must be able to supply potential free contacts for starter disengagement and over speed alarm (normally done through a standard tacho relay). The M2000 is typically used as an engine controller for diesel or gas driven generator sets. The operator can start the engine either by pressing a button on the front facia, or by providing and external start signal through a potential free contact (e.g. a relay). The M2000 can be configured to perform multiple start attempts. The M2000 detects a successful start from the crank disconnect signal provided by the tacho relay (normally at 33% of nominal speed). The M2000 will operate the fuel valve as well as a start warning signal shortly before cranking the engine. The progress of the start sequence is clearly indicated on the front facia LEDs.